Melvin Cornell Blount (born April 10, 1948) is a former Pittsburgh Steelers cornerback, five-time Pro Bowler and a 1989 Pro Football Hall of Fame inductee. Blount is considered one of the best cornerbacks to have ever played in the NFL. His physical style of play made him one of the most feared defensive backs in the game at a time when pass interference rules were less stringent. He founded the Mel Blount Youth Home. Blount was born in Toombs County, Georgia. The early years of his life were spent in poverty on a Georgia farm. Blount was a star in baseball, football, basketball, and track at Lyons High School. Upon graduation, he was offered a scholarship to Southern University in Baton Rouge, Louisiana. While there, he was a Pro-Scouts All-American pick as both safety and cornerback. Blount was the prototype cornerback of his era and a significant reason why the Pittsburgh Steelers were the dominant team of the National Football League in the 1970s. A third-round draft choice of the Pittsburgh Steelers in 1970, he had the size, speed, and quickness for the position, plus the toughness and mental ability to adjust his coverage tactics and excel despite rule changes that favored receivers. A Pro-Scouts All-American as both a safety and cornerback at Southern University, Blount became a starter in the Steelers secondary beginning in 1972. That season, he did not allow a single touchdown. Blount was equally effective playing either zone or man-to-man defense. Known for his rugged style of play, his specialty was the "bump-and-run" pass defense. Because of his size and speed, he physically overpowered pass receivers. Midway through his career, however, the rules regarding pass coverage were changed, making such harassment of a receiver illegal. The rule would come to be named the Mel Blount Rule. Blount ended his career with 57 interceptions, which he returned for 736 yards and two touchdowns. He intercepted at least one pass in all 14 NFL seasons and led the league in interceptions with 11 in 1975. Blount also was used as a kickoff returner early in his career. He totaled 36 returns for 911 yards and a 25.3-yard average. He also recovered 13 opponents' fumbles, two of which he returned for touchdowns. Blount, who was named the NFL's most valuable defensive player in 1975 by the Associated Press, earned All-Pro acclaim in 1975, 1976, 1977 and 1981. He also was a four-time All-AFC selection and played in five Pro Bowls. His fumble recovery in the 1979 AFC Championship Game led to the Steelers' winning touchdown in a 27-13 victory over the Houston Oilers. A season earlier in Super Bowl XIII, Blount's interception ignited a Pittsburgh drive that resulted in a go-ahead touchdown in a 35-31 victory over the Dallas Cowboys. Following his football career, Blount became Director of Player Relations for the NFL, serving in the position from 1983 to 1990. He also became active in charity work. He founded the Mel Blount Youth Home, a shelter and Christian mission for victims of child abuse and neglect in Toombs County, Georgia in 1983. In 1989, he opened a second youth home in Claysville, Pennsylvania, near Pittsburgh. The Mel Blount Youth Home was investigated for the use of corporal punishment in the 1990s. In 1989, he was inducted into the Pro Football Hall of Fame and the Louisiana Sports Hall of Fame. He was inducted in the Georgia Sports Hall of Fame in 1990. In 1994, he was named to the NFL's 75th anniversary All-Time team. In 1999, he was ranked number 36 on The Sporting News' list of the 100 Greatest Football Players. Blount has two daughters, Shuntel and Tanisia, has five sons: Norris, Dedrick, Akil, Jibri and Khalid. His son Akil played college football at Florida A&M and was signed as an undrafted free agent by the Miami Dolphins. Jibri plays college basketball at Cleveland State. His youngest son, Khalid Blount, is a football player who was ranked as a 2-star recruit by Rivals before attending Duquesne University. Blount currently resides in Buffalo Township, Pennsylvania, on a 303 acre farm that includes the site of his former youth home. ^ Bradley-Stek, Tara (March 16, 1984). "Mel Blount retires after 14 year career". The Gettysburg Times. AP. p. 13. Retrieved February 16, 2012. ^ Bofah, Kofi. "The greatest NFL cornerbacks of all time". Yahoo! Sports. Retrieved April 4, 2012. 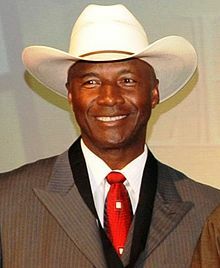 ^ a b "Hall of Famers: Mel Blount". The Official Site of the Pro FootballHall of Fame. Retrieved September 5, 2012. ^ "Delinquent Care". Pittsburgh Post-Gazette. April 10, 1993. Retrieved January 16, 2012. ^ Dani Bostick (May 1, 2016). "Akil Blount signs with Miami Dolphins was released and now has been signed the Pittsburgh Steelers". USAToday. Retrieved July 19, 2016. ^ "Jibri Blount - Cleveland State Men's Basketball". Cleveland State Men's Basketball. Retrieved July 19, 2016. ^ "Steelers' HOF Mel Blount continues pursuing his passion in retirement". WPXI.com. November 18, 2018. Retrieved November 28, 2018. Wikimedia Commons has media related to Mel Blount. This page was last edited on 17 January 2019, at 00:58 (UTC).